It's October and after Thanksgiving, but I am not quite ready for the mayhem that accompanies the excitement of Halloween activities. So, we go mellow, yet seasonal, with fall activities. Scarecrows are one of my favourites. 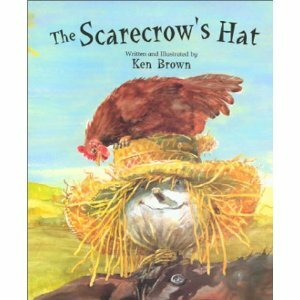 And one of my favourite scarecrow books is The Scarecrow's Hat. It's my pick for Susanna Leonard Hill's Perfect Picture Book Friday. "That's a nice hat" said Chicken to Scarecrow. "Yes it is," replied Scarecrow. "But I would rather have a walking stick. I've been standing here for years now, and my arms are so tired. I'd love a walking stick to lean on. I'd swap my hat for a walking stick any day." 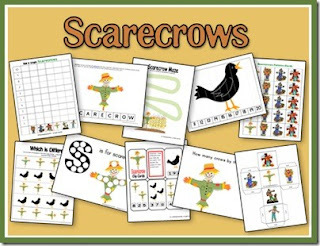 Chicken wants Scarecrow's hat; Scarecrow will swap it for a stick. Chicken does not have a stick, but she knows someone who does. Chicken goes on to swap items with Badger, Crow, Sheep, Owl and Donkey before managing to acquire the stick to swap with Scarecrow. But why does a chicken need a hat? 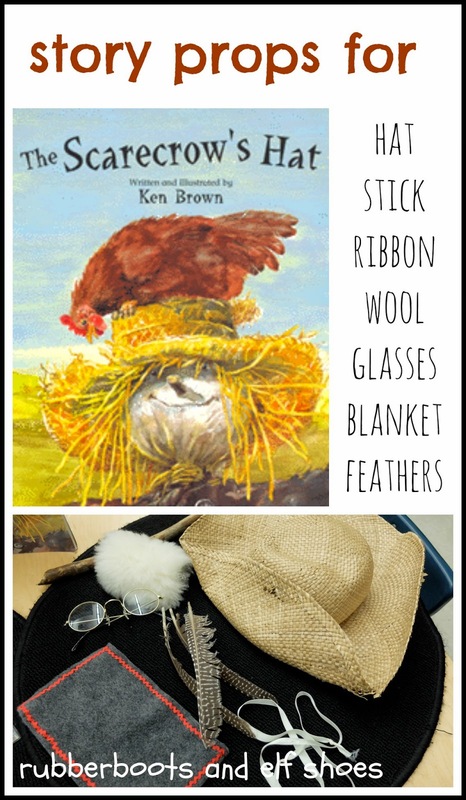 The Scarecrow's Hat is a lovely, gentle book. The repetition in the story makes it an engaging read-aloud. What stands out for me are Ken Brown's gentle (that word again) yet vibrant, friendly and accessible water colour illustrations. The animals' varying personalities shine though their facial expressions. As seen through the illustrations, the world is a very comfortable, safe place where everyone's wants and needs are met. And I just love the word "swap". 2 Teaching Mommies has a free downloadable Scarecrow unit with lots of pre-school /kindergarten activities. 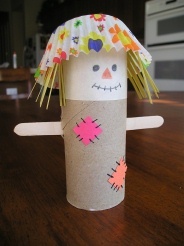 Busy Bee Kid Crafts has instructions how to make this pretty darn cute toilet paper roll scarecrow. 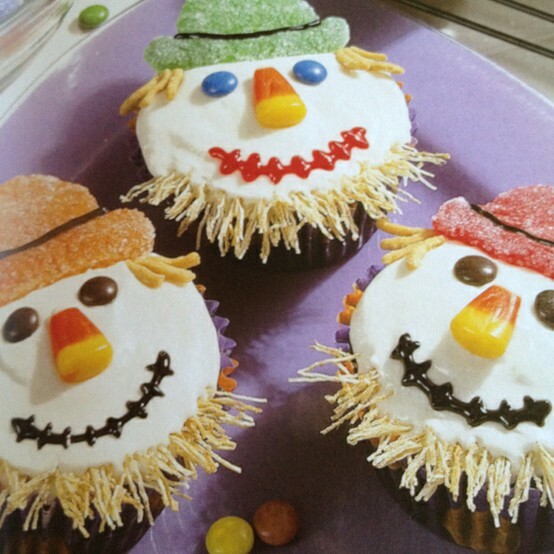 These scarecrow cupcakes are well beyond my patience-in-the-kitchen range. But they do look fantastic. They were originally pinned on Pinterest by Lisa Van Husen. Enjoy the Dingle Dangle Scarecrow. Just Montessori collected pictures of the animals and props for retelling the story. That inspired me to collect some bits and pieces for retelling the story in my classroom. Go tradtional. 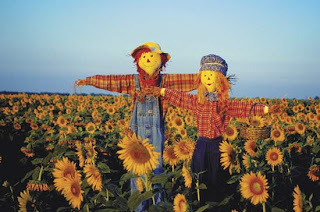 Make a scarecrow. What a perfect book for fall. Sounds like kids will have a ball with it. Especially like your activities. Such fun! I love the cover, it makes me think of "gentle." Sounds like a sweet book. Thanks for adding to PPBF.